We began the day at the Magic Kingdom to say goodbye to Kate’s family. Today was their last day in Orlando and we wanted to see them before they headed home. 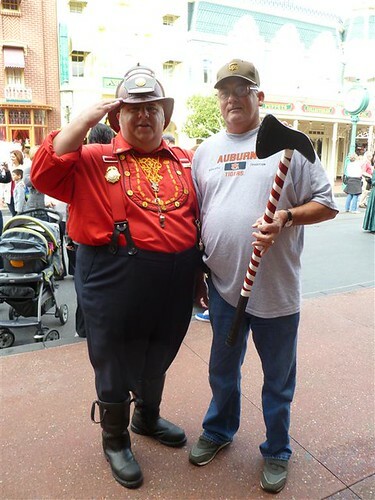 While doing some last minute souvenir shopping on Main Street, Mr. Frank found the chief of Main Street’s Volunteer Fire Department and stopped for a photo. I don’t think that ax would make through the baggage check at the entrance of the park. 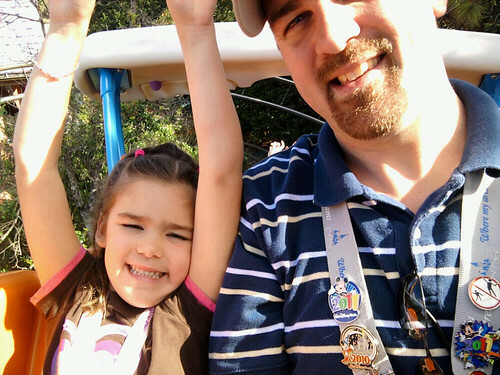 After Kate’s family left for home, Anna and Isabelle wanted to ride Goofy’s Barnstormer. 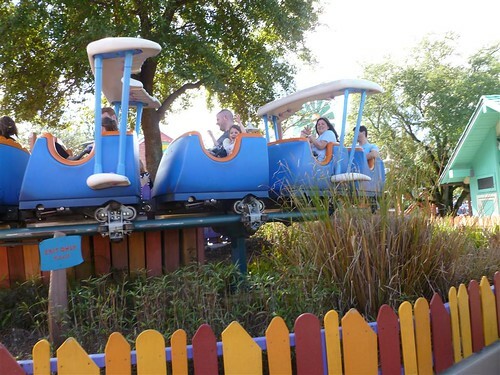 We made our way over to Toon Town and used the Baby Swap option to take turns riding. As you can see, Anna is the dare devil of the family. Isabelle is much more tame, but she did tell Kate that she will hold her hands up next time if someone holds on to her. 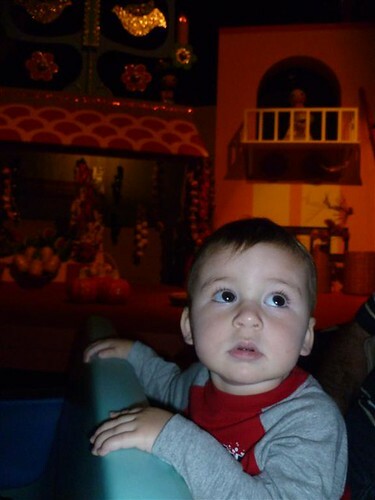 This is Luke’s third trip to Disney World and yet today was his first time on It’s A Small World. During his first trip he was only 2 months old and we never got around to riding the ride. 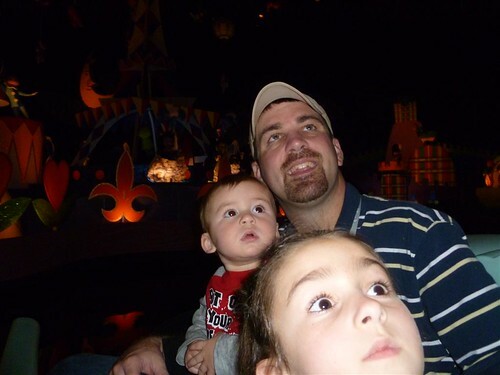 His second trip last September, the ride was closed for refurbishment. So Kate was really excited to see his reaction to the ride since it is one of her favorites. I think he liked it. He kept pointing at everything. Here are a few photos. Since we have already spent a couple days at the Magic Kingdom, we decided to make our way over to EPCOT. 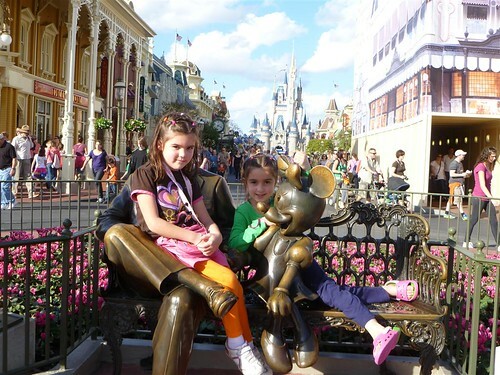 On way out of the Magic Kingdom, the girls wanted to pose with the statue of Minnie and Roy Disney. 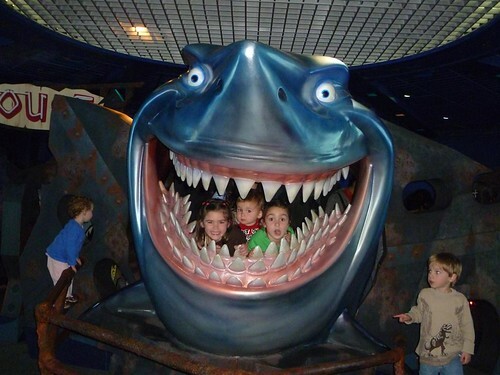 In EPCOT, we headed over to the Seas with Nemo and Friends and took our traditional picture with Bruce the shark. For some reason, people refused to get out of the way for our photo. After waiting for our turn to get the picture, I had to politely ask four people to move so I could get the picture. Even though they moved, they did not get their children out of the way, so here is our three kids, and a couple of extras. It’s not like it was crowded, they just wouldn’t get out of the way. As Disney Visa cardholders, we are allowed a special meet and greet at EPCOT that comes with a free 8x10 photo. 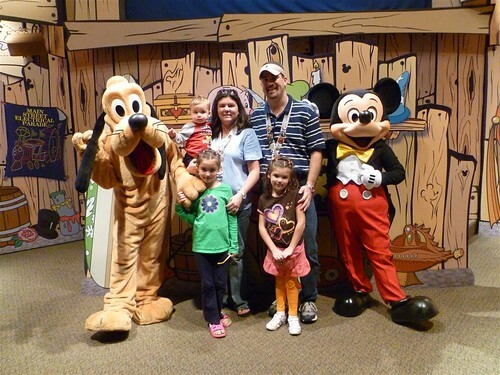 This was Luke’s chance to get close to Mickey and Pluto. All he could do was point at them. He was pretty excited. Tomorrow we will pick up my mom from the airport and she will join us the remainder of the trip. My brother Mike and his family will also be driving in tonight. On a side note, after reviewing my post. I realized I have made several spelling and grammar errors. I am typing these post late at night and I am not proof reading them. Please forgive me for the errors. I will try to fix them when we get home.